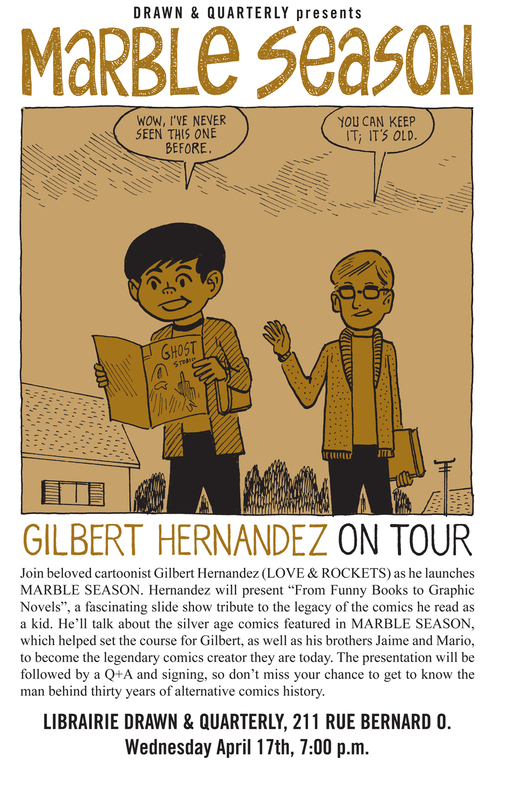 211 Bernard: Gilbert Hernandez at the Librairie D+Q on April 17th. Gilbert Hernandez at the Librairie D+Q on April 17th. You know how April is that month in Montreal when you think Spring is here, but you then get snowed on, hailed on, and temperature drops a million degrees after some freakish warm snap? Well, April is ALSO the month that Librairie D+Q is making your comic dreams come true, with two events with comics book legends! Mark your calendars for Alison Bechdel on April 12th and Gilbert Hernandez touring for his new D+Q book MARBLE SEASON on the 17th. Seems like only yesterday that we hosted Chris Ware, Adrian Tomine and Charles Burns!